It’s Dogwood Time in Tennessee! I love living close to downtown. It makes it easy to join in activities on the spur of the moment and then takes only minutes to be back home. 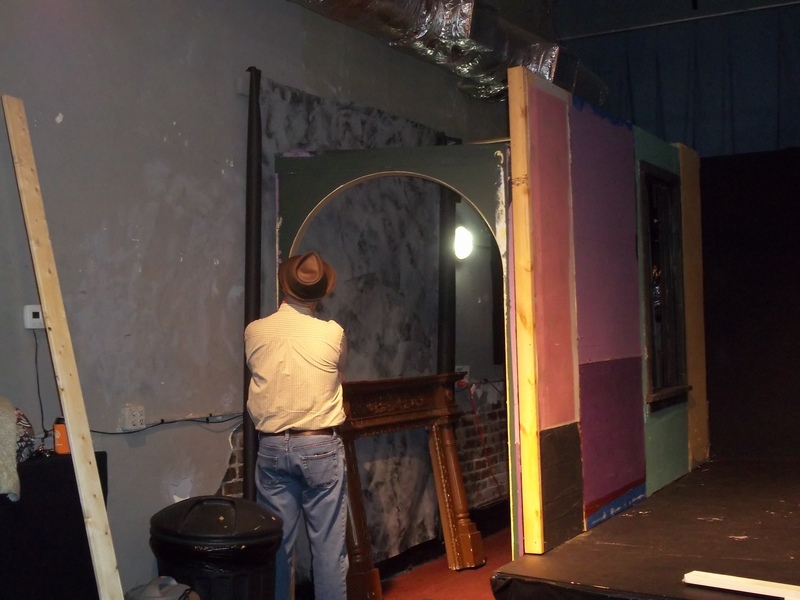 This past Saturday Theatre Knoxville Downtown (TKD) e-mailed that a work day was being held at the theatre to get ready for the next production, The Inspector Calls, a J.D. Priestly mystery. At 10:00 a.m. I was rounding the corner from Broadway onto Magnolia when this sweater caught my eye. 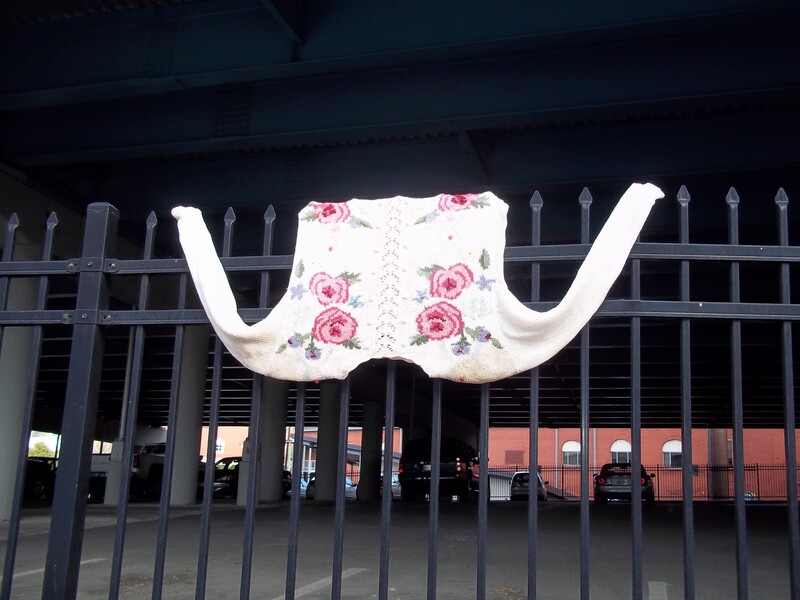 There was a lady standing there with the wet garment and, after parking, I walked over and talked to her. She had washed the sweater, either because of mud or coffee (the reason changed back and forth throughout the conversation), and hung it out dry. A church, where she helped out by keeping back people who were trouble or made too much noise, gave it to her. I took a picture of her with the sweater but she didn’t want her name given so I didn’t include that one. I wished her luck with it drying and headed into the theatre. TKD is the longest continuously-operating, non-academic theater in Knoxville, now in its 39th season. Located at 319 N. Gay Street, its home since 2005, it is an intimate theatre setting which seats about 50. 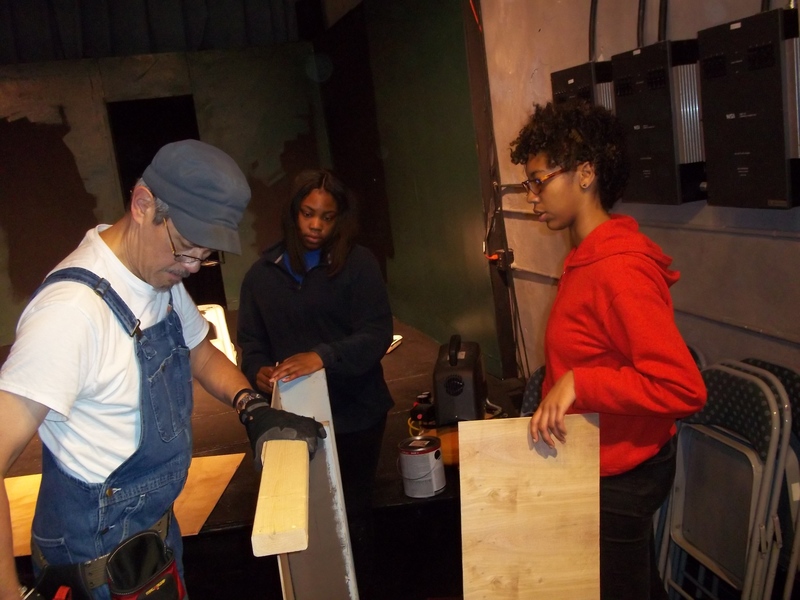 Volunteers for this organization do it all when it comes to getting a production ready for showtime. 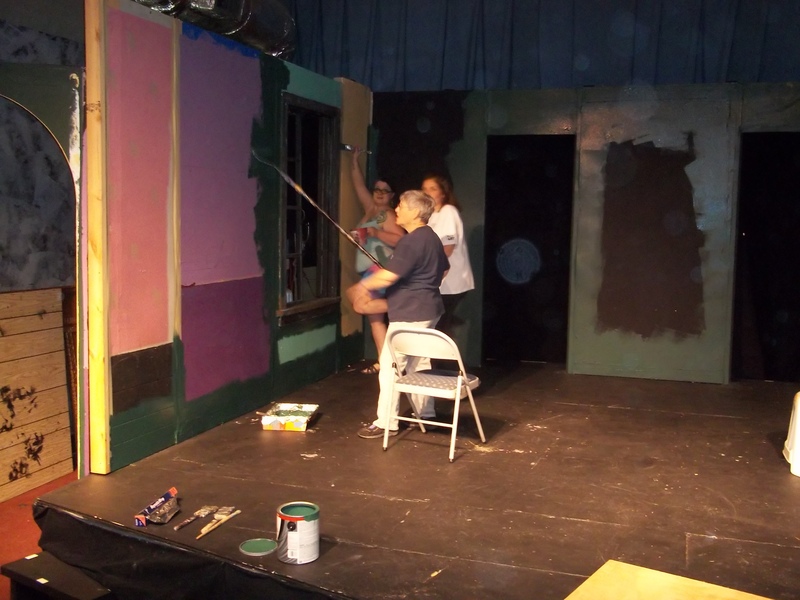 There is painting the set and rounding up props and cleaning the bathrooms and getting out publicity. Saturday morning the concentration was on painting the stage, building a bar (I think) and making a presentable archway. l to r, Windie Wilson, Board Treasurer, Kristi Lafasto, volunteer,and Board President Bonny Pendleton paint molding. l to r, yours truly, Freddi Birdwell, a volunteer as well as a performer in this production, and Emily Maples, a volunteer who started as a high school intern 10 years ago and is now a UT Theatre major. Below, R.L. Pope, known simply as “The Pope,” is a thinking volunteer. The productions TKD and other small, non-profit theatre groups in Knoxville create are top-notch with quality actors. Support them with money and time and enjoy the intimate, quality entertainment they offer. TKD can be followed on Facebook or through their website, both Theatre Knoxville Downtown. Part II of my Saturday downtown later…………….